Prairie Berry Karma - Sukha Sweet! I came home on Sunday to discover my neighbors in my yard with machinery "stealing" my Saskatoons! It turns out they were making pies to sell at the local diner to raise money for homeless seniors downtown. 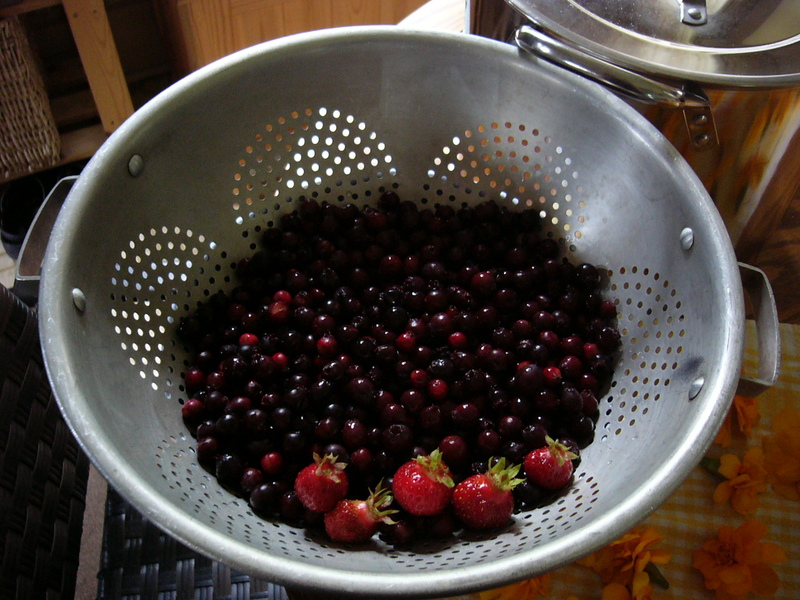 The very next day as I was out walking, another neighbor offered me bowls and bowls full of berries from her bush. Big wheel keep on turnin', karma keep on burnin'! For me, Saskatoons = Summer. Since my childhood I remember scouting for wild berries each year and struggling with bowl and bent tree limb, or just picking and eating right off the branch. I've always loved the sweet taste of the berries, warm in the sunshine, unwashed and unprocessed but they are equally delicious in jams and pies, on french toast and cereal. No doubt in addition to their Karma Yoga, my neighbors were picking for the same reasons I do, to share the sweetness of nature's candy in the brutally short northern growing season. But these precious prairie treats also have an esteemed history as a staple food for the native population and pioneers in this area because of their outstanding nutritional value and versatility. Modern nutritionists call them a "superfruit", they are so loaded with antioxidants that they are even better for us than blueberries! But let's get back to sweetness itself. Sthirasukhamasanam (Yoga Sutra 2:46), or in other words, the poses should be sthira (steady) and sukha. Now most often this word sukha is translated as comfortable, so that the translation usually comes out something like, "The postures should be steady and comfortable". But I'd like to add a little to that definition of asana, on the topic of sweetness. In other words, there should be an element of a "good ride" inherent in the asana. But also, etymologically speaking, some say there is a connection between the Sanskrit word sukha, and our modern words sucre (French), Zucker (German) and sugar (English)! To me, this suggests that the definition of asana by Patanjali must include this element of sweetness. It seems to imply a joy or succulence in the stillness of the posture. I won't deny, I had some pretty choice non-Yogic thoughts about the position I found myself in when I saw my neighbors raiding my stash... but it reminded me that nearly every position we find ourselves in is akward... at first. If instead of reacting to our discomfort, we can be still with the akwardness, we often find it shifts and we are able to identify with the sweetness or ease in the posture or in the situation instead. In this situation, what could be sweeter than neighbors who care about and act for the sukha; for the comfort, ease and enjoyment, the "good-ride" of others? Loka samasta sukhino bhavantu. "May all beings be happy. May all worlds attain peace and harmony." Or from this perspective, "May all your worlds be as sweet as warm ripe Saskatoons."